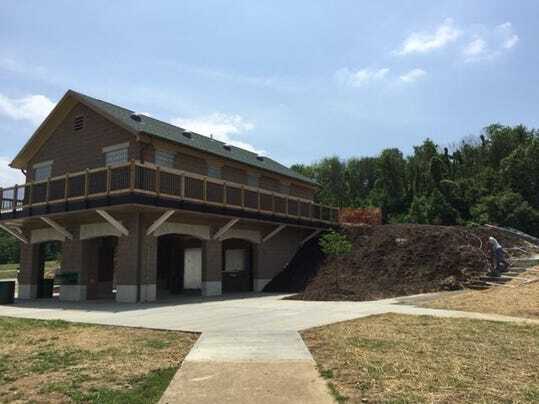 A new beach house that was instrumental in bringing the 2015 USRowing Club National Championships to Clermont County is now open at East Fork State Park’s Harsha Lake. The July 15-19 event 25 miles east of Cincinnati, is one of the largest summer regattas in the U.S., and it’s expected to draw thousands of athletes and spectators. The beach house at Harsha Lake, costing just under $1 million, was among $88.5 million in last year’s capital budget to modernize trails, campgrounds and recreational facilities in Ohio parks, said James Zehringer, cq director of the Ohio Department of Natural Resources. He joined dozens of other state and local officials at a June 6 ribbon cutting to celebrate the grand opening of the new facility. As a backdrop to the event, dozens of would-be rowers tried out their skills on Lake Harsha as part of National Learn to Row Day. The beach house, which has showers, restrooms and a concession area, replaces an outdated facility built in 1978. East Fork State Park also has new docks built specifically for rowers, thanks to state watercraft funds, and plans call for more state-funded improvements by next year. The East Fork State Park improvements were the first ones done with the state capital funds allocated to improve Ohio parks, Zehringer said. He thanked local representatives in Ohio state government, including Ohio Sen. Joe Uecker and State Representatives Doug Green and John Becker, for working with the governor to get the money to fix up East Fork State Park. About a year ago, Paul Schmid, head coach for Clermont Crew, which will co-host the USRowing Club National Championships with USRowing, then-Ohio Senate President Tom Niehaus, and members of the Clermont County Convention and Visitors Bureau, approached state officials about the need to improve the facilities at East Fork State Park. Want to know what’s happening in Clermont County? Follow me on Twitter @CindyLSchroeder.